A few weeks ago, Chris and Megan made the journey from Corvallis to Seattle to check out the new digs. Knowing that they were both relatively familiar with the area, the typical tourist agenda just wouldn't do. As I racked my brain for some neat activities, I remembered an event that a coworker had mentioned to me, Dine Around Seattle, so I got on the trusty intertubes to do a bit of research and solidified plans for an awesome night out. Dine Around Seattle is actually less an event and more a month of awesomeness. In it's tenth year of existence, Dine Around Seattle is a bi-annual promotion wherein during the months of March and November many of Seattle's finest restaurants offer a three-course gourmet dinner for only $30 (tax, gratuity, and beverages not included). Oh yea, the promotion is Sunday - Thursday as well, but totally a great an excuse to go out more than just Friday or Saturday. As I scanned the list of nearly 30 restaurants participating, a little bird in the back of my head kept saying "Rays, Rays, Rays." Sure enough, there it was, Ray's Boathouse, a fine seafood establishment in my neighborhood that many friends had recommended. I quickly made a reservation and we were all set. The marketing pitch: Ray's Boathouse is world-renowned for its impeccably fresh Northwest seafood. The culinary professionals, led by Executive Chef Peter Birk, hand select the best products from local purveyors and then prepare them simply to enhance the naturally fresh, clean flavors and succulent textures. My analysis: Spot on, mate. We arrived for our reservation and were led past some prominently displayed Wine Spectator Award's of Excellence to the back of the restaurant, a gorgeous table overlooking the sound. We could see the seagulls out the window looking at us longingly, knowing that we were in for a phenomenal experience. I grabbed the wine list and dove in, poring over nearly 700 wines primarily with a Northwest focus. Where to start! Feeling a bit nostalgic for the Willamette Valley and knowing seafood was on the menu, I flipped to the Pinot Noir section and was pleased to see an old favorite: Spindrift Cellars Pinot Noir. Spindrift has been on the agenda for Le Tour de Pinot and have always been good friends to the Blog. I was sold and the wine was showing beautifully. Now was the difficult part, choosing the dining selection. The soup was creamy, spicy, and exuded fresh, local, and seasonal with every spoonful. The salmon was definitely the showcase of the evening, prepared medium rare with the lemongrass syrup and mango adding some nice accentuating notes. It paired perfectly with the wine I had selected (no big deal), and left me feeling full but just wanting a little more. The pistachio cake is not something I would normally order, however, it came highly recommended from the server and I learned long ago that it's good to push outside my box and listen to the expert serving staff. It was worth it. Unfortunately, all good things must come to an end as this meal did. You, however, still have the opportunity to experience Dine Around Seattle for one more week, and you'd be a fool not too. 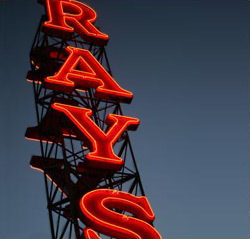 Ray's was great, as I'm sure a number of other restaurants are as well. Do it, and drink some great Northwest wine while you're at it! Dine Around Seattle is really similar to Sonoma Restaurant Week where restaurants offer meals for either $19, $29, or $39. Great events that give access to areas of great dining. My fiancee and I are big fans of Oregon Pinot and I've been following your blog at least since you've moved to Seattle. Excited that such an expert on Oregon wine and blogger has moved up to our neck of the woods. Dine Around Seattle is one of my favorite events and it's hard not to resist going to Ray's. We decided not to this year because we want to continue to try new places. I was glad to hear that it was a great experience for you. Have you tried any other restaurants on the Dine Around Seattle list? My top recommendation is Monsoon in Capitol Hill. It's Vietnamese cuisine prepared with very modern techniques, and the great thing about it is that they offer virtually their whole menu for the special. If you go, I promise you that you won't be disappointed. If you're interested, I wrote a short blog entry on the Dine Around Seattle here. We're always looking for more Oregon Pinots to drink. Whenever we go down to Oregon, we always try to purchase bottles that we can't find up here. Some favorites of ours is Lachini (which we actually first discovered at Ray's), Cameron, and J.K. Carriere. We just drank some Durant Cellars last night. Do you know if there are any retail places in Seattle where we can find the Spindrift? It's one I've never heard of before, and since it's a favorite of yours, we'd love to try it. I think you meant to say that you had medium rare salmon rather than medium rate?